How do you help someone who has been deserted by God? How do you help a Christian who has been deserted by God? Does God desert people? You will surprised at the answer. The Puritan Pastor was about a great many duties. He preach, catechized and edified the saint, and entreated the sinner to repent and turn to be saved by Jesus Christ. He witnessed to the lost and encouraged the saved. On the surface, the pastoral role seems black and white. But what did the pastor do when the regenerated saint felt as though he was deserted by God? Is there such a state that a saint of the Most High could feel and experience a dejection or spiritual declension before the One who saved him? The answer is an emphatic “yes!”. Symonds, in this book, explores the dreadful topic of the deserted soul. What does it mean to be deserted? He demonstrates how the soul may truly be in a state of desertion for a number of reason: possibly from past sins, and so the Holy Spirit withdraws His comforting touch; or it may simply be in the hidden counsel of God, and for the saints good – knowing God does all for our good (Rom. 8:29). Does God really desert the Christian? What do we do when the appearance of desertion and the famine of the soul are upon us? What do we do when we believe we are in the valley of the shadow of death and in the dark? The Puritans did not believe God truly deserted the regenerate soul, though sometimes it seemed that way through the human perspective. These times of the souls declension are called “the dark night of the soul,” “the soul’s winter-time” and most popularly “desertion.” In this work, Joseph Symonds sets forth the classic puritan position of “desertion” showing its causes and cures. Symonds acts as the physician of the soul, the godly minister, helping those who do not know if God has truly deserted them or they are simply believing he has because of doubt or depression. Also, he shows those who have truly been deserted (in the right sense of the word) what it means t be deserted and how to cure that problem through various means of grace. This work may also be best entitled “The anatomy of desertions, its case and cures,” for Symonds anatomatizes the doctrine to a degree where you will believe he has exhausted the subject. This is one of my favorite books of all time. It is a classic work not because it just reads well or is orderly in thought, but more so because it is utterly helpful to the soul in its winter-time. Desertion is such an important doctrine to deal with, and every minister of the Gospel must have the ability to treat this spiritual ailment to the best possible course. Since this spiritual ailment is one of the most common to face in pastoral ministry, the pastor must have tool s by which he may encourage or direct the saint back to a state of comfortable walking with God. 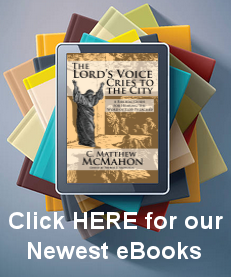 This book is certainly not only for the pastor, but for the Christian. If the Christian is in a dark wintery time of the soul, then there is no better book to buy and devour than this one. Possibly, the dejected Christian may simply be deceiving himself, or, on the other hand, he could very well be in a state of hindered-communion with God on account of a sin he may not fully realize he is committing. In either case, and many more, Symonds gives godly instruction and guidance. This book ranks in the top 50 books of all time in my own library. I would highly suggest reading this book even if you are not in a state of desertion, since being prepared ahead of time may do more good than attempting to work through the declension at the time it is happening.